Domestic violence is a very common occurrence in today’s society and is one of the many inequalities in Canada. Domestic violence and emotional abuse are behaviours used by one person in a relationship to control the other. In many cases, it is assumed the woman is being victimized but in fact, women can often be just as violent as men. According to a Statistics Canada study in 2005, the likelihood of a man being the victim of abuse by his female partner is almost the same as it is for a woman. Approximately 600,600 women and 585,100 men aged 15 and over reported domestic violence in the five years prior to a 2009 survey (Mahony, 2011). Many men experience violence from their partners just as women do, however men do not have the same support systems from society. Many people overlook the abuse men receive. Our gender expectations that have men living up to particular masculine ideals lead to an under reporting of their victimization. While the frequency of domestic violence experienced by women and men are similar, women are more likely to experience more serious forms of violence. The majority of abused women and men claimed that the most serious violence they experienced was being pushed, shoved or slapped. Female victims of domestic violence reported that the most serious violence used against them involved being beaten, choked, or threatened with a hand gun or knife, compared with male victims who were more likely to report that the most serious violence they experienced was being kicked, bitten, hit or hit with something. Among those who stated that they had been injured, 75% of men and 95% of women victims reported that bruises were the most common form of injury, while 59% of male victims and only 30% of female victims reported suffering cuts, scratches or burns. 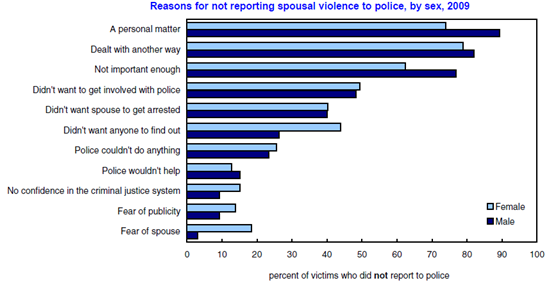 This graph shows the various reasons for not reporting spousal violence to police. More men than women claimed they felt that it wasn’t important enough, or it was a personal matter, or police wouldn’t help or they dealt with it another way. According to the Public Health Agency of Canada, men who are abused by their female partner find it difficult to maintain the self-reliant, independent, tough, strong and masculine ideal for men that is expected by society. In their study of men who were abused by a female partner, the men reported feeling emasculated, marginalized, and embarrassed, which made them reluctant to talk to someone about the issue or express their fears. When they spoke of their experience, the men claimed that they received reactions of disbelief, surprise and skepticism from friends, neighbours, the staff of domestic abuse shelters, legal-based institutions and hospitals. The domestic abuse of women has been well known and studied for many years since feminism brought it out into the public eye. Many forms of support have been developed as a response to the growing knowledge and changing perspective of the domestic violence of women including legislation, policing policies, as well as shelters. However,the issue of the domestic abuse of men is not as well known or understood by the general public in Canada. It is clear that the numbers of men and women victimized by domestic violence are becoming more equal than in previous years, however the number of men who are victimized but do not come forward is a problem. Society’s masculine ideal prevents many men from coming forward out of fear of looking weak. They do not have the same support women receive in cases where they are victimized which is an inequality that should be addressed in Canada. Grandin, E. & Lupri, E. Intimate Partner Abuse Against Men, Public Health Agency of Canada (2009, November 26). Link. Mahony, Tina Hotton. “Women and the Criminal Justice System,” Women in Canada: A Gender-based Statistical Report, Statistics Canada (2011). Link. Statistics Canada. Family Violence in Canada: A Statistical Profile, Canadian Centre for Justice Statistics (2011). 12- 15 Link. The Daily. Family Violence in Canada: A Statistical Profile, Statistics Canada. (2005). Link. This is a clear description of a major problem society is not prepared to accept, male victimhood. Keeping this updated with the ever increasing body of work that gives a very different picture of victims and perpetrators of domestic violence can only be helpful to men, women and children. Men are often denigrated and made to feel as if their victimhood is nonexistent or unimportant. Thank you for helping to make a difference to those men and their children.